North Head is believed to have been used as a ceremonial site by the native Camaraigal people. These days, most of the headland is part of Sydney Harbour National Park. Since the time of European settlement in Australia, the towering sandstone cliffs of North Head have witnessed the arrival of a variety of ships sailing into Sydney Harbour. This image belongs to the travel and nature stock photo library. This stock photo of North Head Cliffs at Sunrise is available for licensing for commercial and editorial uses including websites, blogs, books, magazines, brochures and advertising. Restrictions may apply for images which contain third party copyrighted material or sensitive subjects. Photos of artwork are for editorial use only. 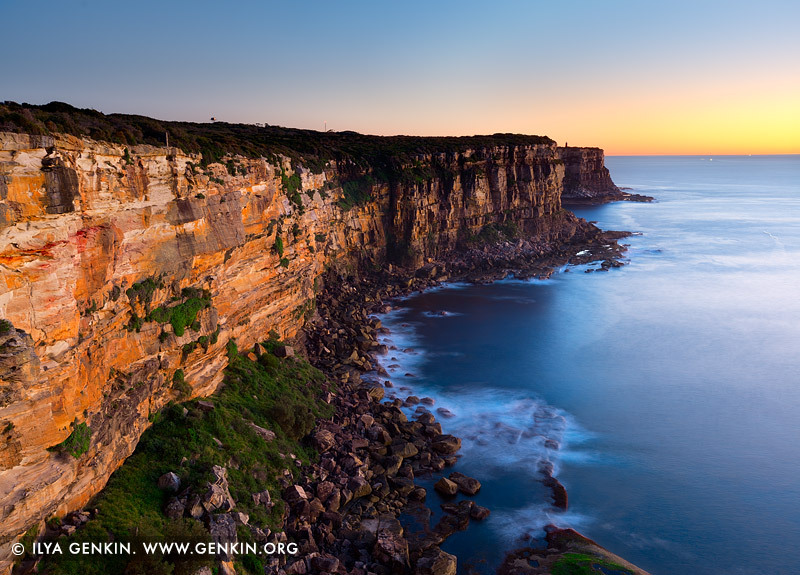 This image id AU-NORTH-HEAD-0002 of North Head Cliffs at Sunrise, is copyrighted © by Ilya Genkin. This is not a public domain image.